I’m not sure I’ve ever taken Blink 182 seriously, and that’s probably what the band wants. The southern California trio has built an impressive career bringing their unique brand of pop punk to the masses, and it’s a success story built on a band who never take themselves too seriously and pushed the world out of a dark place when grunge had everyone muting their colors and drowning in a giant pool of self-inflicted sorrow. Fast forward 25 years—yes, I know you are feeling old right now, so am I—7 records and two-thirds of the “original” band are still going strong. So strong that they sold out two nights at London’s famed O2 Arena. 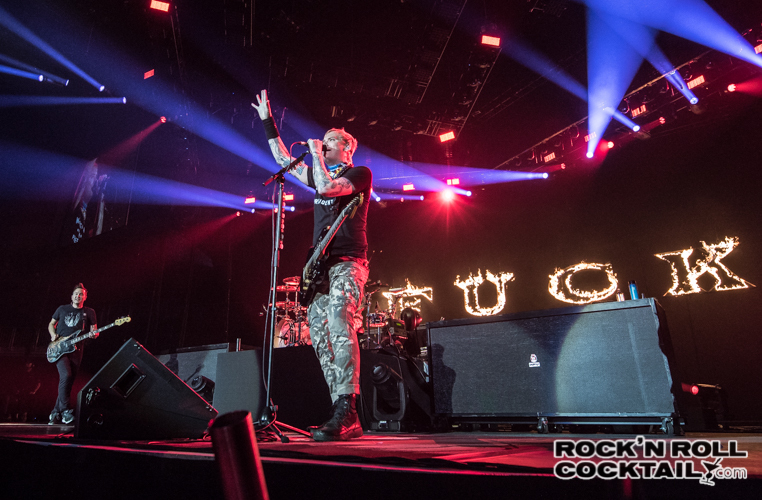 Having not seen the band in 20 years or more, I wasn’t sure what to expect, especially since founding member Tom DeLonge’s departure and Alkaline Trio’s frontman joining the group full-time. Those feelings of uncertainty were laid to rest after the first few songs. Matt Skiba is an absolute rock star and an explosive addition to the band. This guy is half punk rock, half Pete Townsend and fits in so well you would have thought he’d been there since the beginning. 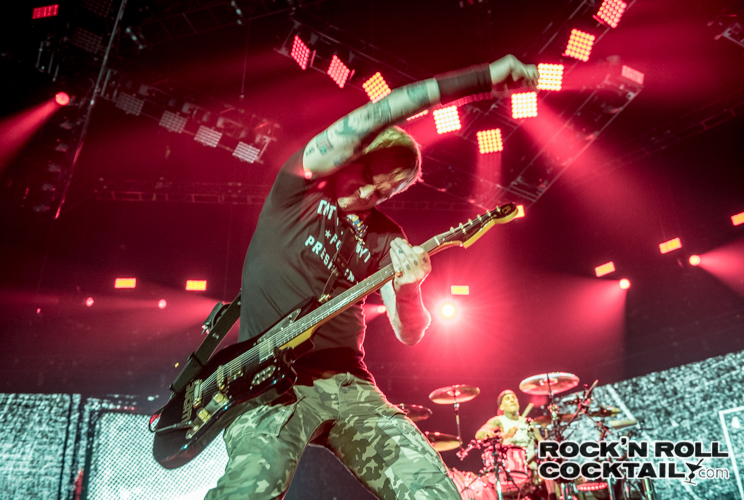 He brings a certain edge to the band that had been absent over the years, but not necessarily missing. It’s the dawn of a new chapter for the band since the delivery of that first album with the “new guy”—and in this case they hit it out of the park. 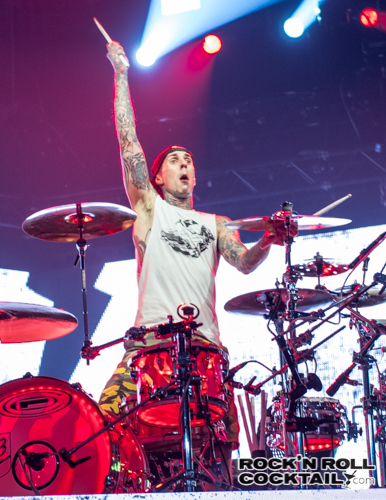 Add to this the charisma, wit, and charm of Mark Hoppus offsetting the powerhouse that is the almighty Travis Barker on drums, and you have one of the most energetic shows on the planet at the moment. The only downside is that their songs are pretty short, which winds up with a set that clocks in at just over an hour. Did they miss anything? Not that I can think of, but another 15 minutes would have likely called for another 8 songs. Highlights from the set included all the radio hits you know and love, “All the Small Things,” “The Rock Show,” “What’s My Age Again,” and…well you get the picture. What was surprising to me was the opening song of the night, arguably my favorite song, “Feeling This” from their terribly under-celebrated, self-titled 2003 release. One last note about this experience as a photographer. Myself and a few other photogs were escorted backstage to get to the photo pit for the first three songs. 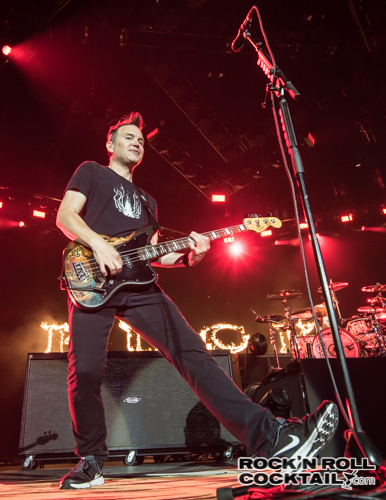 Mark Hoppus was standing a few feet away from us getting ready to run out onto the stage—something us photogs rarely see. 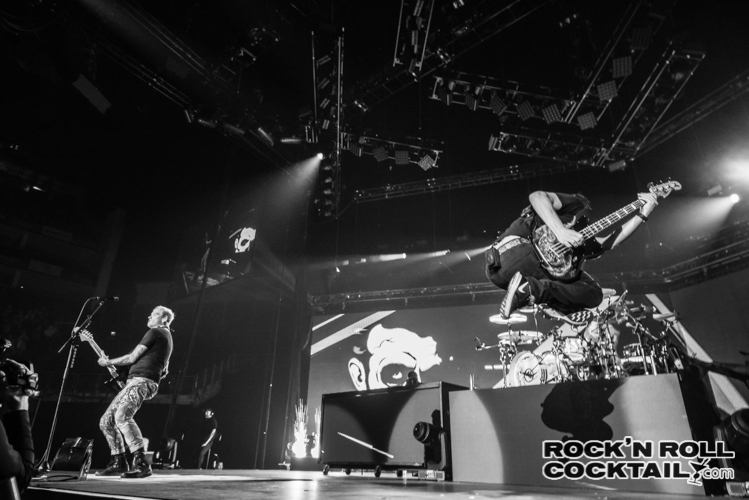 Mark walks over to us and says, “At the top of the third song I do a little ditty on my bass then run to the side of the stage and do an epic jump. I hope that’s helpful.” That’s pretty much the coolest thing any band has ever said to me before photographing them, and why wouldn’t they prep us for what’s sure to be an epic shot?